Well we are officially 2 days past Baby E’s due date, so it looks like he’s decided to sit tight for a little while longer. 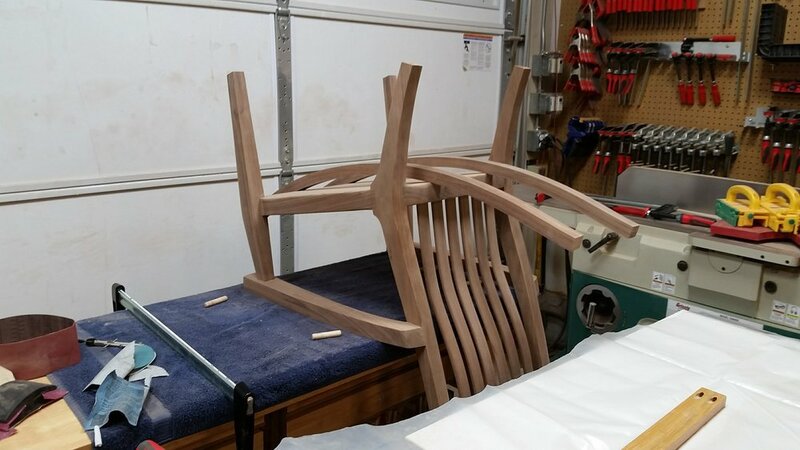 Lucky for me, his delayed arrival has given me enough time to make some really good progress on the rocking chair. The front ends of the arms attach to the front legs with dowels, so I needed to drill holes in the underside of the arms to accept the dowels. The rear arm joints needed to be scribed to the rear legs to refine the fit. Here you can an uneven gap where the arm meets the rear leg. After a little work, I got the rear arm joints fitting nice and tight. After getting the arm joints fitting just right, it was time to glue, screw, and clamp them in place. Here’s a closeup view of the rear arm joint. The ends of the arms are purposely left a little long, so they can be ground flush later. 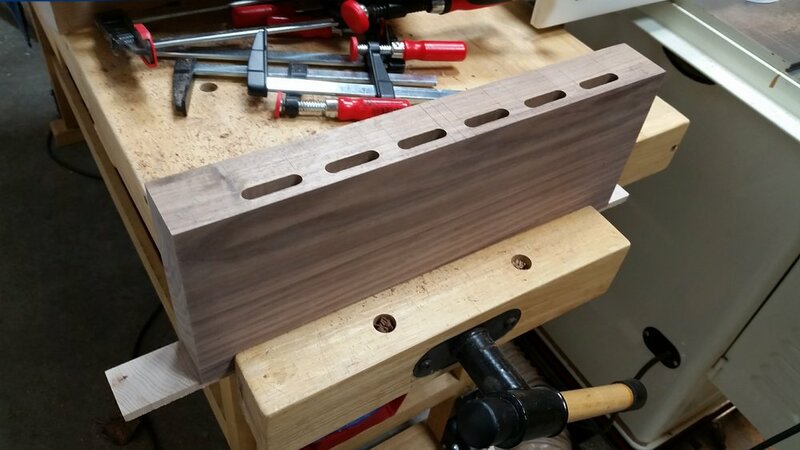 While the glue on the arms was curing, it was time to move on to making the headrest. After milling and squaring some stock, I laid out the mortises to accept the top ends of the back splats. 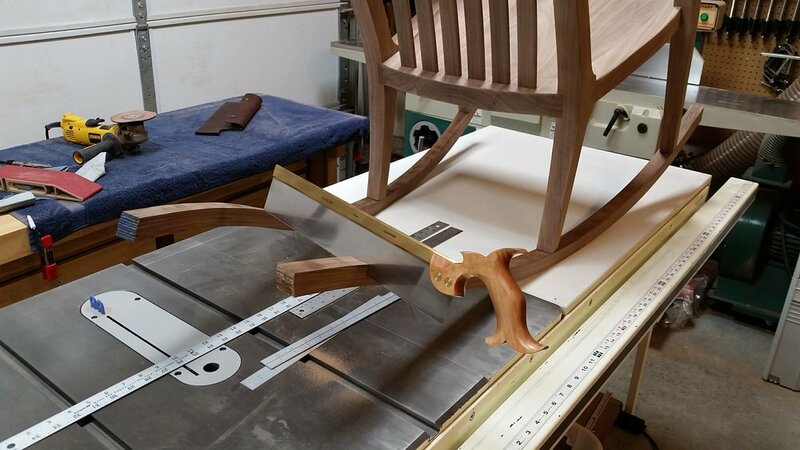 To cut the mortises in the headrest, I used the same router jig setup that I used to cut the mortises in the seat slab. 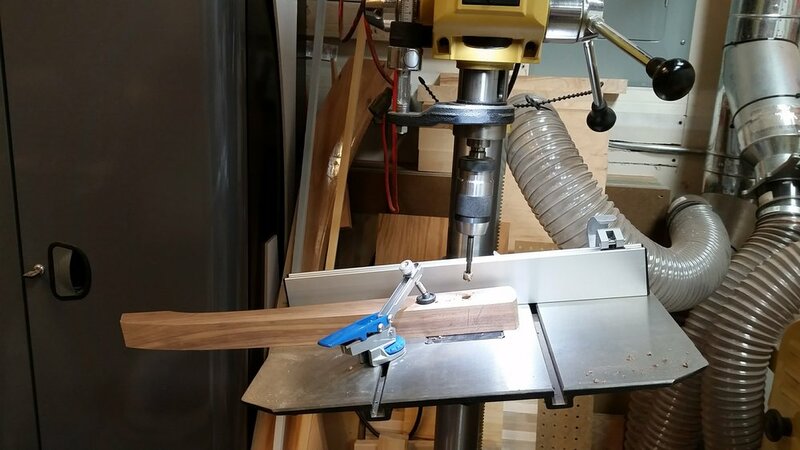 Clamp, plunge router, move jig, and repeat six times. Here’s all the mortises cut into the headrest stock. Some careful layout ensured that the mortises in the headrest matched up with the mortises I’d already cut in the seat slab. 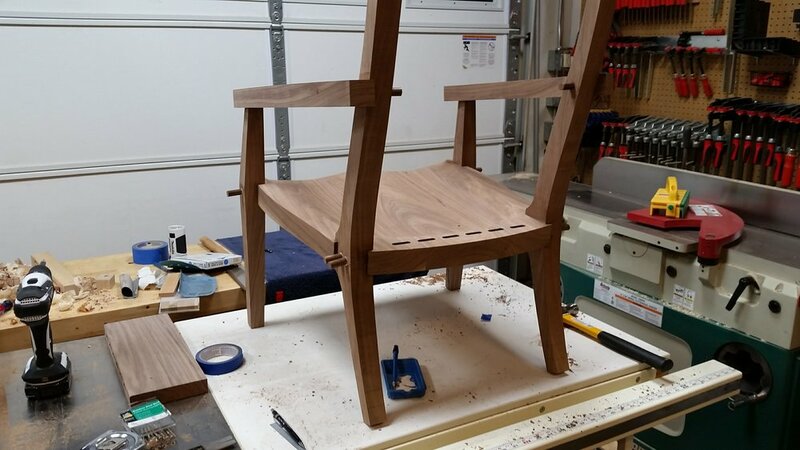 After cutting all the mortises, I dry clamped the headrest in between the rear legs. As you can see, there was quite a bit of material sticking proud of the rear legs. I made a mark to reference when resawing the bulk of the material off. 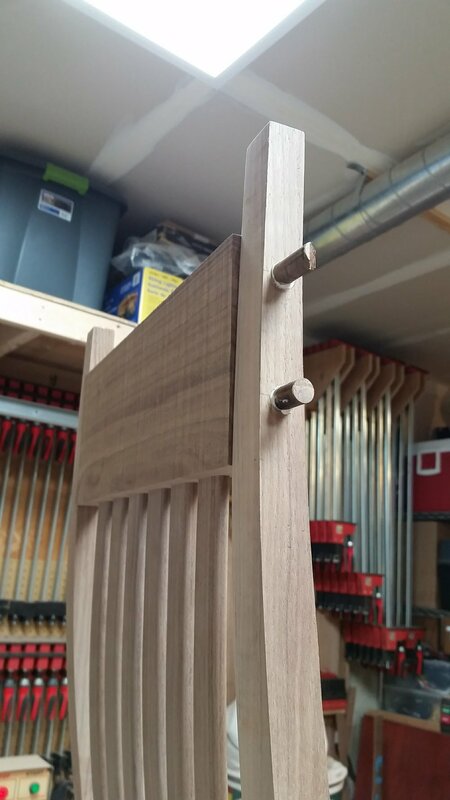 I resawed most of the excess material off the headrest, but left it just thick enough to stick slightly proud of the front and back edges of the rear legs. Time to make some plugs out of some cutoff scrap material. I used the plugs to conceal the screwheads, because nobody wants to see screwheads. A few more screws and plugs to reinforce the headrest. Notice that the rear of the headrest is still sticking proud at this point. After the glued plugs cured, I used a sanding disc on the angle grinder to grind the plugs flush and to blend the seat joints smoothly into the rear legs. I also ground the ends of the arms to blend them into the rear legs. 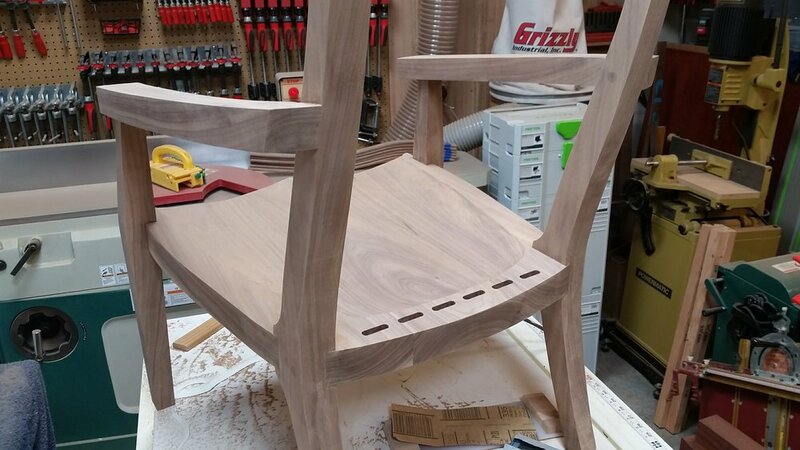 After all the blending and sculpting work was done, it was time to move on to contouring the headrest to flush it with the edges of the rear legs. I used a handplane to slowly work the surface of the headrest down, one shaving at a time. Next I moved on planing the backside of the headrest. The end result was a headrest with a slight curvature that matches the exact curvature of the rear legs. 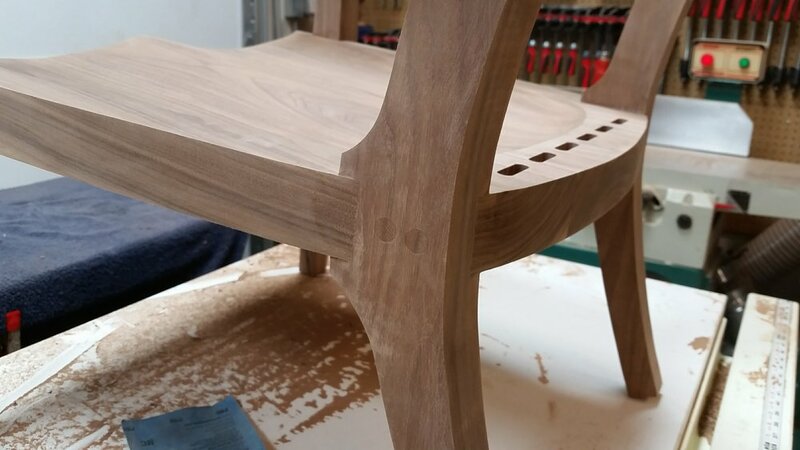 After getting the headrest close to flush with the rear legs with the handplane, it only took minimal sanding to make the headrest perfectly flush. Since the bottoms of the legs were square and the runners are curved, I needed to refine the fit by scribing and sanding the bottom of each leg. Once I got each leg close, I dialed in the fit by slipping some sandpaper between the runner and the bottom of the leg. By running the sandpaper back and forth between the leg and the runner, any small gaps were pretty much eliminated. The runners get attached to the legs with dowels and epoxy, so I needed to drill holes in the runners to accept the dowels. Prior to gluing the runners in place, I used a handsaw to cut them to their final lengths. I used some epoxy thickener to thicken the epoxy, otherwise it would run all over the place. 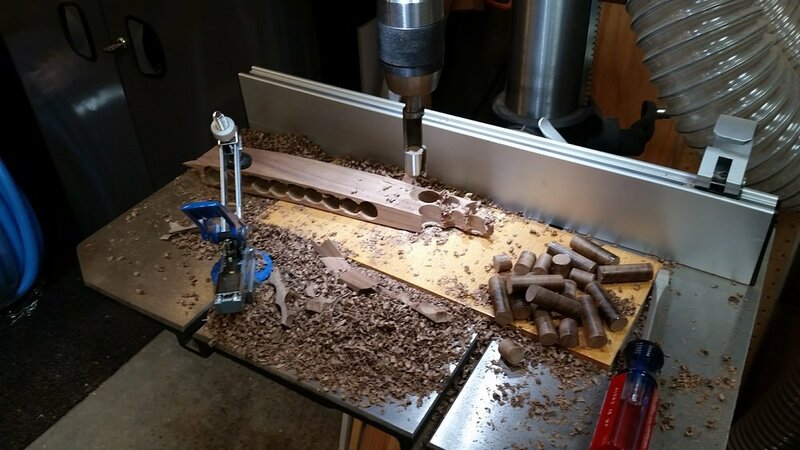 I also mixed in some walnut sawdust to color the epoxy so any squeeze out would match the walnut. Here’s the runners and dowels ready for the epoxy. And here’s the runners clamped in place with the epoxy. All that’s left to do now is the final sanding and applying the finish, which is a process that will likely take at least a week to accomplish, if everything goes perfectly. So with Baby E’s arrival likely to happen any day now, it’s looking like I probably won’t have the rocking chair 100% done in time, but it will be VERY close.